Gregg Davidson has highlighted the support by the Portadown fanbase towards The Sandy Fraser Raffle as one positive from Saturday. 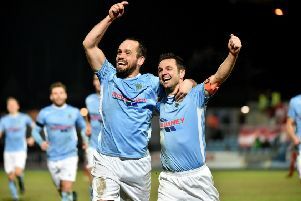 The former Ports favourite spent time before kick-off with Brian Strain, who lifted the Irish Cup as club captain on two occasions, selling tickets outside The Oval turnstiles. Proceeds from the raffle of Fraser’s 1990 league winner’s medal will go towards the family of the late David Mills. “We were sold out within an hour or so and it was a brilliant example of the generosity of the fans,” said Davidson. “Davy was a fantastic guy and it is a wonderful gesture by Sandy, with fans really getting behind the idea. “It was also nice to see so many old friends and there was a great atmosphere. Tickets for the raffle draw or tomorrow’s (Saturday’s) Portadown Supporters’ Society-organised awards in Tandragee Golf Club remain on sale from the PSS or Bill Emerson. A supporters’ bus for the PSS awards night in Tandragee Golf Club will depart from JD Tipler’s at 6.30 and Shamrock Park at 6.45 tomorrow (Saturday), with a return to Portadown at midnight following the dinner. Other former Ports players cheering on Saturday from the stands at The Oval included Billy Paton, Andy Hunter and Matthew Tipton.